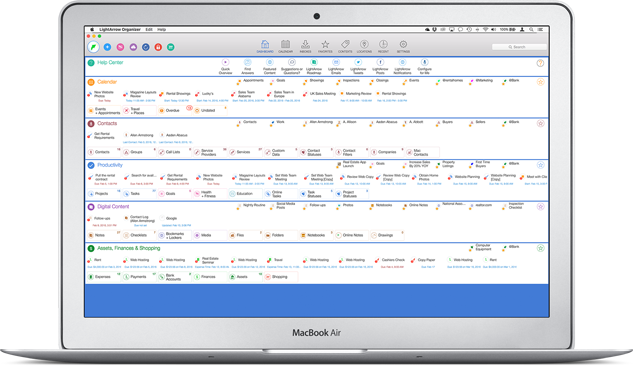 Stop wasting time and money on an assortment of different, disconnected productivity apps and start managing everything in one place with LightArrow Organizer. 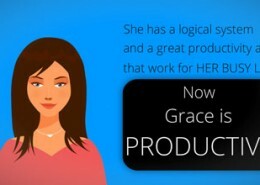 Increase your productivity with the most complete app for managing work and life in one place. 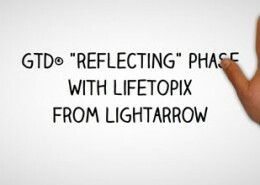 If you practice GTD® or you just want to get your professional or personal life under control, LightArrow Organizer is impressively suitable for you. 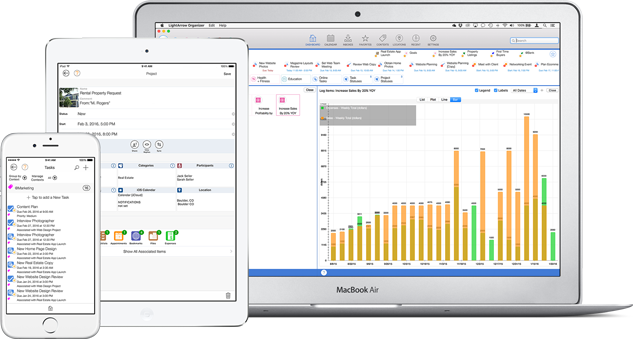 With LightArrow Organizer, you get instant visibility into what’s important in your busy work and life through the customizable LightArrow Dashboard. 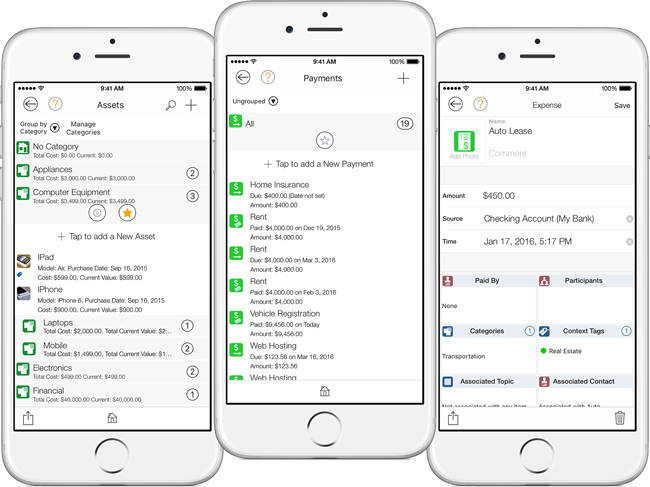 In a glance, see your calendar, projects and other work tasks, contacts with alerts, important digital content and what’s going on with your finances. Versatile, beautiful and easy to use calendar views. We know your calendar is one of the most important tools that you use for organizing your life and getting organized at work. 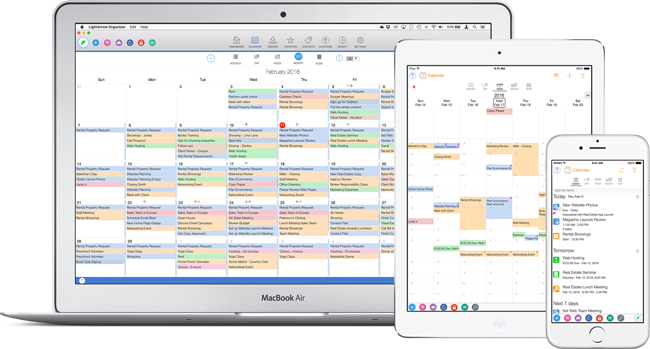 That’s why we provide comprehensive, easy-to-read and user-friendly calendars in LightArrow Organizer. A daily agenda, daily calendars, weekly calendars, monthly calendars and yearly calendars ensure you quickly know what’s important today, tomorrow and in the future. Improve relationships with clients and potential customers through superior Customer Relationship Management (CRM). LightArrow Organizer offers powerful customer relationship management for contacts and prospects. Keep track of unique customer information by creating custom forms and fields, organizing by contact groups, creating contact groups and adding social media information. 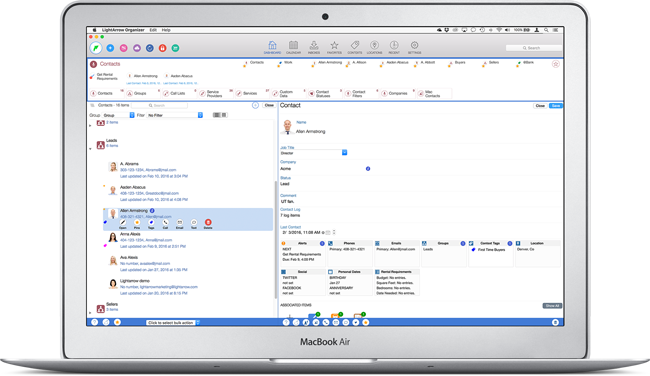 Plan and manage timely follow-ups by creating call lists, tracking interactions, planning follow-up activities and instantly viewing and responding to social media posts. 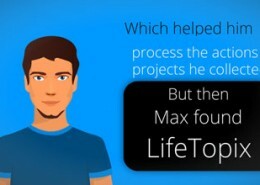 Easy to use project and task management. If staying on task and getting things done are included in your goals for life and work, you will love LightArrow Organizer’s Productivity views. Statuses, alerts, context tags, nested tasks, location awareness and connections with digital resources keep you aligned with your objectives. Best of all, LightArrow Organizer projects are fully integrated with your calendar views. Create and organize local and online notes and files, checklists and media. With LightArrow Organizer, spend less time searching for information you need. Create, organize and easily retrieve digital content such as notes you created in LightArrow Organizer or from online services, checklists and to-do lists, media, media services, photos, audio clips, drawings, and video clips. Organize and remember all the websites that you frequently visit, manage the usernames and passwords that you use, and secure private information. Best of all, keep track of your notes and files in context with the things to which they should be associated. For example, associate a project’s budget files to the project, itself. We know you use best-in-class cloud apps for storage and organization of notes, files and tasks. That’s why LightArrow Organizer works with Evernote®, Toodledo®, Dropbox™, Box™, OneDrive™ (SkyDrive), Asana™, Google Docs, Facebook, Twitter, Email, SMS and more. View, capture and process information from a variety of online sources. In today’s world, we’re overloaded with information from a variety of places. It’s delivered through social streams, files, email messages and the web. This is why we centralize information into one app, and allow you to make data actionable in just a few simple taps. With LightArrow Organizer, instantly view and convert email messages, Tweets or Facebook posts into appointments, tasks, shopping items, events and more. Get visibility into notes from Evernote® through feeds and instantly make important notes actionable. Manage finances, assets, travel, purchasing and more. 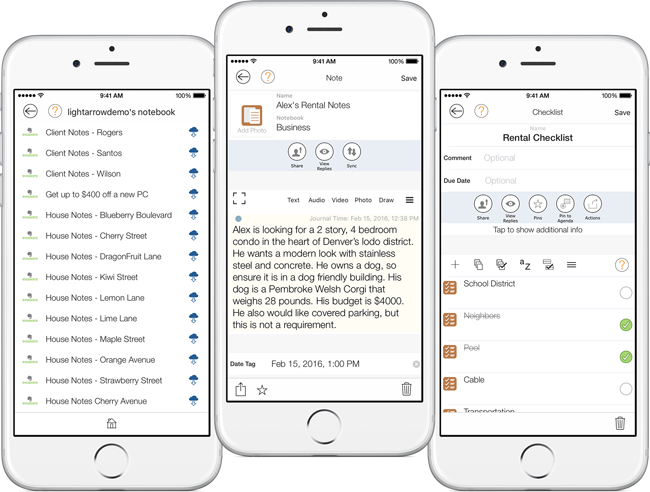 LightArrow Organizer catalogs the assets you lease or own, coordinates the trips you take, and helps you monitor your purchases and finances. And you’ll never miss a beat because the dates of your trips and visitors, shopping lists, checklists, expenses, bills and appointments are automatically reflected directly on your LightArrow calendar — complete with reminders set according to your preferences. Meeting the unique productivity needs of your industry or role. With LightArrow Organizer’s device-to-device sync with a free Dropbox or Google Drive account, your data is always available, whether you’re using your iPhone, iPad or Mac. LightArrow Organizer is designed to help you achieve your goals. Create goals and track steps to accomplish your goals with custom metrics, tasks and more. Analytics lead to a wealth of rewards for business and life. View metrics of your goals, health, activity and contacts with LightArrow Organizer. Harvest and act on data from a variety of feeds including Email, Twitter and more. Convert inbox items into actionable objects, such as tasks and calendar events. Change theme colors, modify navigation to light or dark, change font sizes, modify display order and more. Track the services you receive including account information, service dates, bills, and payment information. Track service providers from whom you receive services, including ratings. We believe it’s important for your app to suit your particular needs. Create custom statuses for projects and tasks that are suitable for your work and life. 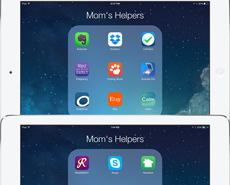 LightArrow Organizer items that are location-based — tasks, shopping items, events, trips, etc. — automatically show on a map to help you make plans for the items that are in your vicinity. Set GTD® context tags for many items in your LightArrow app to help you plan and organize. Tags are available for tasks, projects, appointments, reminders, events, notes, checklists, files and most other objects. Use Custom Forms to capture information about your customers, prospects, health and activity. Custom forms can be applicable to groups and statuses. Better manage customer and prospect relationships by creating call lists and tracking contact history.